Friday February 19th 1904 Will did a big churning for me. I got the dinner and was busy every minutes of the forenoon. Will and I went over to Hartsocks in the afternoon & had such a nice call. Anna has not been well. Mollie did not go home tonight. I spent the evening picking out nuts for tomorrow. I had a letter from Sallie Reed. weather more pleasant. Saturday February 20th 1904 Mollie went down town early this morning. I got my things ready and we went about ten oclock. Father and Mother have been married 59 years today. They had a nice dinner for just the near relatives. Dorothy Bremner was up from Burlington and George Bremner and wife were there with Fannie. I did evening work. Lorie about the same. 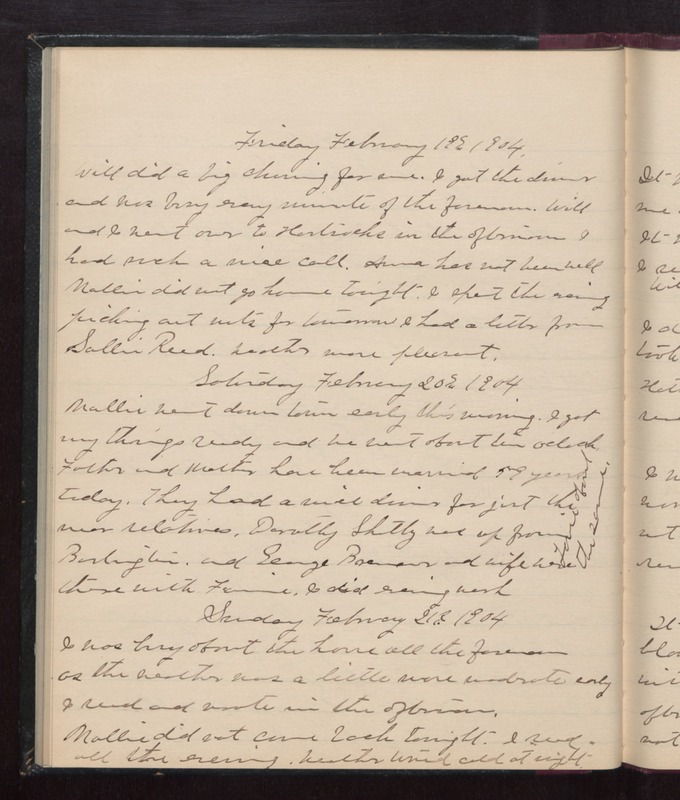 Sunday February 21st 1904 I was busy about the house all the forenoon as the weather was a little more moderate early. I read and wrote in the afternoon. Mollie did not come back tonight. I read all the evening. weather turned cold at night.